Fastest glide and ultra stable for those learning to paddle, the Atlas is a fantastic cruising board for the entire family up to 120kg. Re-engineered Zen technology: more fibres, less coating and minimized glue usage. On the water you will sense the acceleration and fun feel of a light hull, actually up to 2kg ligher than our 2016 editions. A great sensation while paddling. and also make the rails incredibly strong. We replace double PVC layers with 2000 denier deck and bottom stringers, providing the board that rigid, crisp and stiff feel. The lamination process uses minimal glue and solvent and packing of the board is free of plastic. • Integrated towing D-ring on of the nose. • 2mm EVA deck pad with croc skin texture. 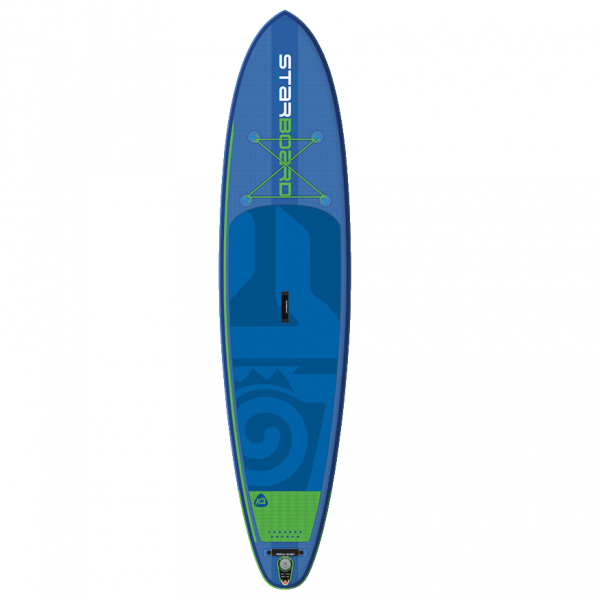 • FCS II SUP Touring 9” for Paddle For Hope and SUPKids Racer. • Flex fixed fins on Converse, Drive, Wide Point, Whopper, Blend, Atlas, SUPKids 8’0”and 9’0”. • Supplied with Zen bag and Double Action pump. *Recommended to inflate boards between 15-18 PSI for optimum stiffness and performance.